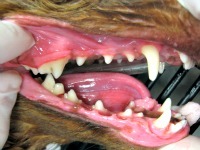 Periodontal disease is one of the most common clinical condition in cats and dogs, and is completely preventable. Proper dental care can detect dental disease that not only affects the mouth, but can also lead to more serious health problems such as heart, lung, and kidney disease. Good dental hygiene is just as important for pets as it is for humans. Yet, it is one of the most overlooked areas in pet health. Yellow and brown tartar build-up along the gum line. Inflamed gums and persistent bad breath. Change in chewing or eating habits. Abnormal drooling, subdued behavior, and tooth loss. Dental care is an essential part of your pet’s health. Not just because it will make breath better, but also because it contributes to overall wellness. Bacteria that result from diseased teeth and gums can enter your pet’s bloodstream and travel to organs such as the lungs, heart, kidneys and liver, starting infections there. 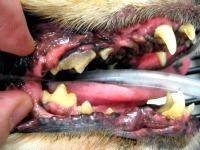 One of the major causes of heart disease in dogs is dental disease. We can extend your pet’s life expectancy 3-5 years with good preventive dental care. Periodontal disease is the overall term we give to infections in the tissue surrounding the teeth. Plaque and tartar form when food stays in the cracks and crevices of the teeth, especially along the gum line. In the early stages of periodontal disease, plaque is still soft, and brushing or other dentifrice can remove this plaque. When plaque mixes with saliva, it hardens and becomes tartar and calculus. Bacteria, plaque, tartar and calculus irritate the gums, making them tender, red and swollen. At this point,a professional cleaning is needed. If the plaque and tartar buildup continues unchecked, the tooth may be come infected. In the final stages of periodontal disease, the tissues surrounding the tooth are destroyed, and the bony socket holding the tooth erodes, leading to mobility and loss of teeth. Periodontal disease can be prevented and treated. 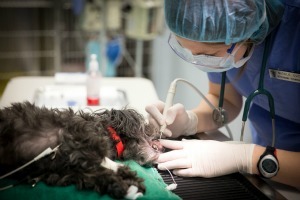 The keys to your pet’s oral health are professional veterinary dental care and good home care.